Detroit’s 2015 North American International Auto Show had plenty of attention-grabbing rides, and the Ram Rebel ranked near the top of the list. 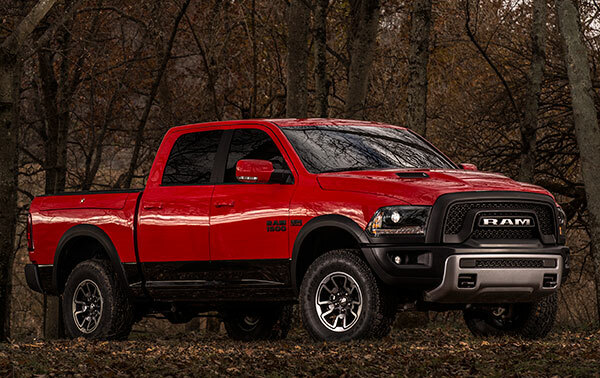 When it goes on sale this spring, the 2016 Ram Rebel will be the 10th variation of the current Ram 1500 pickup. Ram Rebel is a rig that will look a little out of place anywhere other than Baja California or the annual SEMA show in Las Vegas. The styling is about what you’d expect if a teenage boy was turned loose on a Ram design computer: monochrome paint treatment (five colors to choose from) with lots of black on the rocker panels, fender flares (borrowed from the Ram Power Wagon), modified front and rear bumper covers, and a grille that lacks the traditional Ram crosshair configuration for the first time in 25 years. 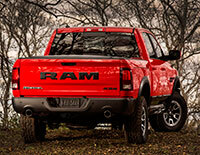 There’s a big Ram logo where the crosshair normally resides, and another on the tailgate. No possibility of mistaken identity here. Other exterior elements include an aluminum twin snorkel hood, projector beam headlamps with black bezels, and LED taillights. The pneumatic suspension has been jacked up with a one-inch lift kit and the Ram Rebel rolls on 17-inch alloy wheels mounted with 33-inch Toyo off-road tires. The combination of lift kit and tall tires gives the Rebel 10.3 inches of ground clearance. On occasions when the Rebel uses up all that clearance, e.g., soaring over desert whoop-de-dos, there are skid plates to protect axles, oil pans, and other tender underbody elements. 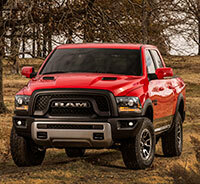 There are two engine choices, both from the Ram 1500 inventory: a 3.6-liter V6 with 305 horsepower, 269 pound-feet of torque; and the robust 5.7-liter Hemi V8, 395 hp, 410 lb-ft. Both send power to the rear differential via Chrysler’s ubiquitous Torqueflite 8-speed automatic transmission. The Rebel is offered with two- or four-wheel drive, but in two-wheel drive versions it’s Hemi only. A limited slip rear differential is on the option list, and the stability control system has been revised to accommodate the altered suspension geometry. Interior elements are consistent with the look-at-me exterior. For example, the cloth inserts in the bucket front seats (heated) repeat the tread pattern of the big Toyo tires. And while the interior is mostly black, the palette includes some intriguing highlight hues. For example, the stitching and other licks are in Radar Red. The seat bolsters are Light Diesel Gray, and the center console is finished in Iron Gray Metallic, to make it look like cast iron.